Background: This movie, written and directed by Richard Kelly, has grown to cult status since it was released ten years ago. It was filmed in 28 days, which just so happens to be the amount of time (28 days, 6 hours, 42 minutes, and 12 seconds) that Frank the bunny tells Donnie he has before the world ends. What it’s about: Donnie Darko (Jake Gyllenhaal) is a troubled teenager with sleepwalking problems who has a vision of a creepy-looking giant bunny who tells him that the world will end in 28 days. While he is out having this sleepwalking vision, a jet engine crashes into his bedroom, wrecking the house. The rest of the movie follows Donnie as he meets a new girl, Gretchen, and tries to understand what is happening to him. A book written by the senile old woman “Grandma Death” tells him about time travel, and Donnie engages in several destructive acts around the town. The movie’s climax takes place on Halloween, where we find out who Frank is and why he said the world would end that day. Why it will keep you up at night: This movie isn’t classified as a horror film. It’s more of a psychological thriller with an eerie, unsettling atmosphere. I included it in my list of Picks because of the creepy tone, the demonic bunny, the disturbing themes, and of course the Halloween party at the end where Donnie dresses up in his skeleton costume. This is a movie that will make you think, and the reason it will keep you up at night is because you are wonderfully disturbed and thinking too hard about what the hell it all means. 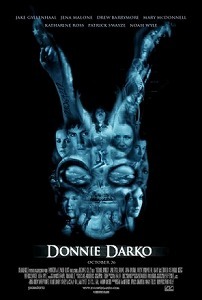 If the original version is too confusing, try the director’s cut; there’s some extra explanation in there that might help you unravel the dark puzzle that is Donnie Darko. I happened across this movie recently (since I was on a Jake Gyllenhaal binge) and agree with you that it is certainly a unique, creepy film. I almost didn’t make it to the end, but am glad I did. It all makes sense in its perverse way. I wouldn’t recommend it for everyone (my husband for one, would hate it), but I liked it. Thanks for passing on the tip regarding the director’s cut – is that only on the DVD? I watched it via my satellite TV. I agree, this movie, considering how strange, confusing, and unsettling it is, definitely is not for everyone. I’m not sure what version they would show on TV; I just know that you can buy two different DVD versions. The version I own is the original, but you can find the director’s cut also–it will say on the DVD cover if it is. You might have to try renting it. you a shout out from Kingwood Texas! Just wanted to tell you keep up the good work!